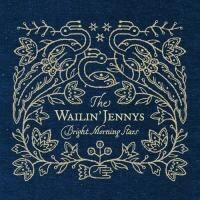 Beautiful three-part harmonies, country-inflected melodies, acoustic arrangements punctuated by occasional electric accents -- these elements have earned the Wailin' Jennys a loyal fan base. Their two previous albums, 40 Days and Firecracker, solidified their status as alt-country divas, and nothing in their latest release, Bright Morning Stars, will undermine that. The three voices of Ruth Moody, Nicky Mehta, and Heather Masse intertwine in impeccable harmony, with each song perfectly suited to the singers' strengths. This is no surprise, as each of the three takes turns on songwriting and lead-vocal duties. Opening track "Swing Low Sail High" isn't the most scintillating start, but the record soon picks up with the plucked banjos and sweet lyricism of "Bird Song" and the wistful "Away But Never Gone". Tempos tend to be slow, in keeping with the album's overall mood, and few tracks feature percussion. It's up to the voices, then, to create sonic variety, and this is achieved through their constant intermingling, with one singer coming to the fore as the others back her up. The show-stopper here is "Storm Comin'", a slow-burner that channels a vaguely gospel vibe with a sinister, apocalyptic undercurrent and astonishingly spooky vocals. Easily the best song on the record, its only flaw is its brevity -- it's nearly five minutes but could happily groove along for twice that -- and the fact that it overshadows everything else on the record. That’s not really a criticism, is it? This isn’t to say that the rest of the album is a bust. "Mona Louise" is something of a letdown, but "Bright Morning Stars" weaves a hypnotic net with its repetitive lyrics and devotional tone: "Where are our dear fathers? / They are down in the valley a-praying". Once more, emphasis is placed squarely on the harmony vocals. Occuring precisely halfway through the album, the song provides something of an emotional high point. The back half of the record suffers a bit from flagging energy and a certain monotony in the sonic landscape. Songs like "Across the Sea", "Asleep at Last", and "You Are Here" are undeniably pretty, and sung with sincerity and skill, but even after several listens it's tough to distinguish one from another. Built upon a foundation of strummed acoustic guitar and vocals, the tunes all have more in common than not. Perhaps sensing this themselves, the Jennys strive to change up the formula somewhat in a couple of the later songs. "What Has Been Done" is a slow, moody number that adds quiet pedal steel keening and percussion -- bongos? congas? -- to the prevailing formula, with good results. "Cherry Blossom Love" takes the experiment a step further, upping the tempo with snappy snare drums and twangy, old-timey guitar. Fans of the style might enjoy the song more than I did. Album closer "The Last Goodbye" utilizes a denser mix of guitars, mandolins, and trumpets (!) that manages to support the vocals without swamping them. It might be a fruitful direction for the band in the future. In a just world, "Storm Comin'" would be a monster hit and everyone would be blasting it out of their car radios this summer. That's not going to happen -- hey, who said the world was just? -- but anyone who appreciates beautiful, heartfelt singing needs to hear that song. And who knows? Maybe the rest of the album as well.